Honestly, we were doing nothing nefarious. We were only making soap. And one of the basic steps involves lye. Roughly, it works like this: you mix the lye with water, then eventually, when all ingredients are the right temperature, you mix it with fats (olive oil and palm oil, with a bit of soy oil, in this case). Then after some stirring, you put it in a mold. The eventual result is what you see in this picture: soap! The soap pictured here is the soap we made last week. 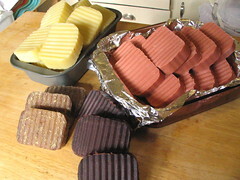 Dark brown is chocolate-orange, light-brown is oatmeal cookie, pink is cherry cola, and the creamy color is unscented, to be used to make hand-milled soap later. The saponification process, when done right, eventually gets rid of the irritating lye. But it takes a while for the soap to cure to the point where it is mild enough. We still need to wait 3-4 more weeks to use this soap. You can handle it just fine at this stage, though, without needing gloves as we did the night we made it. I recommend it; it’s kind of nice to make your own soap. The only thing is, lye has gotten harder to find these days. This time we got it from a soapmaking supplier. I used to buy it at the Red Apple.